The pharmacy department employs two full time pharmacists and is renowned for its expertise in psychiatric medicine. Two years ago, the hospital with over 443 medications, including 285 oral solids, installed a JVM DEN pouch packaging machine with 84 canisters plus a STS guide light and a deblister machine. 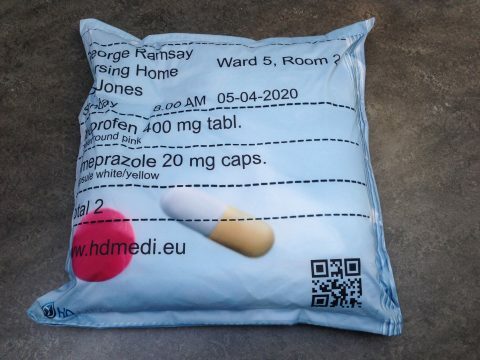 Since October 2015, it has been supplying medicines packed in unit doses, as part of an overall pharmacy service, to the six 24-hour psychiatric clinics providing care for people with mental disorders. These 24-hour clinics also provide diagnostic, therapeutic and rehabilitation services. If you would like to read the complete case study click below. We are looking forward to meeting you during one of the exhibitions in Paris! September 13 was a remarkable day. 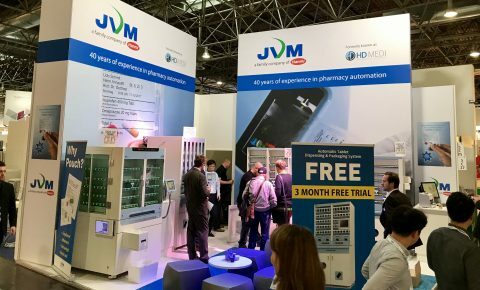 At the Expopharm we communicated for the first time that we have a new name: JVM! In 2014 JVM became a 100% owner of HD Medi and now is the time to also show that in our name and communication. But at the first day of Expopharm the most important thing was the showcasing of all new products to help pharmacies improve the medication adherence of their patients. No less than six new products ranging from deblistering to automatic filling of blistercards to full checking and correction inside a 576 canister pouch packaging machine! There is still time to visit our booth (hall 5, booth C27) until September 16! On this years’ Expopharm, held from September 13-16 in Düsseldorf, JVM Europe will present revolutionary innovations! A pouch packager that guarantees 100% correct pouches. The most compact checking machine in the world. A blister card packaging machine that actually fits your budget. The DOC packaging machine: the best packaging technology with the smalles foortprint. And last but not least: an easy to clean auto canister to save time on loading STS trays, Come and visit us in Hall 5, booth C27. 100% correct pouch packaging on Expopharm! JVM will be present at the Congrès National Des Pharmaciens in France. Come visit us at out booth! Are you flexible, enthusiastic and organized? Then we are looking for you!